This article is about video games played on a console. For video games played on a personal computer, see PC game. A console game is a form of interactive multimedia entertainment, consisting of manipulable images (and usually sounds) generated by a video game console and displayed on a television or similar audio-video system. The game itself is usually controlled and manipulated using a handheld device connected to the console, called a controller. The controller generally contains a number of buttons and directional controls such as analogue joysticks, each of which has been assigned a purpose for interacting with and controlling the images on the screen. The display, speakers, console, and controls of a console can also be incorporated into one small object known as a handheld game. Console games usually come in the form of an optical disc, ROM cartridge, digital download or in the case of dedicated consoles, stored on internal memory. The differences between consoles create additional challenges and opportunities for game developers, as the console manufacturers (e.g. Nintendo, Microsoft, Sony) may provide extra incentives, support and marketing for console exclusive games. To aid development of games for consoles, manufacturers often create game development kits that developers can use for their work. 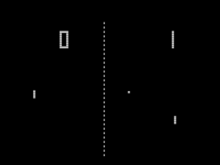 The first console games were for the Magnavox Odyssey, released in 1972, and consisted of simple games made of three white dots and a vertical line. These hardware limitations, such as the lack of any audio capability, meant that developers didn't have a lot of freedom in the type of games they could create. Some games came packaged with accessories such as cards and dice to enhance the experience to make up for the shortcomings of the hardware. The second generation of consoles introduced more powerful capabilities, less hardware limitations than the first generation and coincided with the golden age of arcade video games. Developers had access to basic graphical capabilities of the console allowing them to create sprites of their own choosing and more advanced sound capabilities. 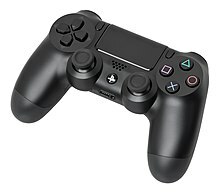 Controllers were beginning to include more buttons giving developers more freedom in the type of interactions they could provide to the player. Due to the success of arcades, a number of games were adapted for and released for consoles but in many cases the quality had to be reduced because of the hardware limitations of consoles compared to arcade cabinets. The second generation of games introduced a number of notable gaming concepts for the first time. Adventure for the Atari 2600 introduced the concept of a "virtual space bigger than the screen" for the first time with the game consisting of multiple rooms to player could visit as opposed to a single static screen. Video Olympics was one of the first console games to have a computer controlled opponent in its "Robot Pong" game mode and genres such as platforming and graphical adventure games began. By the end of 1983, consoles had become cheaper to develop and produce causing a saturation of consoles which in turn led to their libraries becoming saturated too. Due to the levels of games on the market prices were low and despite good sales figures, developers weren't making enough money from sales to justify staying in the market. Many companies went out of business and despite heavy marketing, the quality of the games couldn't back up the marketing claims of heir quality. Pac-Man for the Atari 2600, a port of the original arcade game of the same name, was the best selling game for the console The effects of the crash were primarily felt in the North American market but it still had an impact, albeit smaller, in the Asian and European markets. In the years following the crash, console development was significantly reduced in the North American and European markets. Personal computers rose in popularity and began to fill the gap in the market that consoles had left. They had become affordable, were technologically superior and were multi-function. The third console generation started with the release of new consoles from Nintendo, Sega and Atari. These two generations saw the introduction of notable franchises such as The Legend of Zelda, Star Fox, Sonic the Hedgehog, Final Fantasy, Metal Gear and Metroid. The console manufacturers took back control of third party development and regulated the market, ensuring the levels of saturation didn't happen again. Measures introduced to achieve this included limiting the number of games a developer could release a year, controlling the manufacture of game cartridges, demanding payment for cartridges up front and ensuring the game adheres to a set of rules. This put pressure on publishers and added a risk to development. It meant developers were forced to concentrate on the quality of their games more so than the quantity and speed at which they could be made. Atari and Sega incorporated backward compatibility in the Atari 7800 and Master System respectively, elongating the lifespan of their early console games. Both companies never released another backward compatible console, with the partial exception that the Sega Genesis can play Master System games using a separately sold peripheral. Metroid includes an open world where the player can traverse the world in all directions, where most games similar to it are primarily side-scrolling in a single direction. It also has a strong female protagonist who is often credited for her role in improving the image of women in gaming. Star Fox was Nintendo's first use of polygonal graphics and Sonic the Hedgehog introduced a rival to Nintendo's mascot, Mario, who became a long-standing character for Sega in a number of different types of media. The fifth generation of consoles saw the move from games using 2D graphics to 3D graphics and the change in storage media from cartridges to optical discs. Analogue controllers became popular allowing for a finer and smoother movement control scheme compared to the directional pad. The use of full motion video became popular for cutscenes as optical discs allowed for the storage of high quality video with pre-rendered graphics that a game couldn't render in real time. Games released during the fifth generation took advantage of the new 3D technology with a number of notable franchises moving from 2D, such as Metal Gear, Final Fantasy, Mario and The Legend of Zelda, the latter often being considered as one of the best games of all time and being influential not only to its genre but video games as a whole. Other games that were released during this generation such as Crash Bandicoot, GoldenEye 007, Resident Evil, Tomb Raider and FIFA International Soccer were influential in their own genres and started their own franchises that would span multiple generations and consoles. Resident Evil began the "survival horror" genre and Metal Gear Solid popularised the stealth genre as well as storytelling through cinematic cutscenes rendered in game. Gran Turismo and Sega Rally Championship popularised realism in the racing genre with different surfaces and realistic features such as tire grip. By the sixth generation the console market had become larger than the PC market. While earlier consoles did provide online capabilities, it wasn't until the sixth generation that online services became popular. Games introduced online features such as downloadable content, social features and online multiplayer. Online networks were created by console developers such as PlayStation Network and Xbox Live providing a platform for games to utilise. Online multiplayer allowed players to play together from almost anywhere in the world with an internet connection and the social features of the platforms gave players the means to organise over these long distances. Downloadable content became popular and meant developers could release updates after a game was launched and could include new content or fixes to existing issues. Console games receive commands from the player through the use of an input device, commonly called a controller. Unlike a PC which uses a keyboard and mouse or a mobile device that uses a touch interface, console games are limited in their control schemes by the hardware available for the console. They usually include a method to move the player character (joystick, d-pad or analogue stick) and a variation of buttons to perform other in-game actions such as jumping or interacting with the game world. The type of controller available to a game can fundamentally change the style of how a console game will or can be played. The limitation of the amount of buttons compared to a PC keyboard or a custom arcade cabinet means that controller buttons will commonly perform multiple, different actions to make up for the lack of extra buttons. For example, The Witcher 3 Xbox One controls will use the "A" button to interact with the world when pressed but to make the character sprint when held, whereas the PC control scheme can separate these functions into separate buttons. The limitation of input keys can allow a developer to create a more refined and succinct control scheme that can be learned by the player more easily and different games in the same genre tend to create control schemes similar to each other allowing players to easily adapt to new games. There are games that require additional accessories to act as alternative ways to control the game and to bypass the limitations of a standard game controller. Such items can include light guns, electronic instruments or racing wheels. Consoles commonly use a television as their visual output device: optimal for viewing at a greater distance by a larger audience. As a result, many video games are designed for local multiplayer play, with all players viewing the same TV set, with the screen divided into several sections and each player using a different controller. Video games have generally had access to less computing power, less flexible computing power, and lower resolution displays. Dedicated consoles were advanced graphically, especially in animation. This is because video game consoles had dedicated graphics hardware, were able to load data instantly from ROM, and a low resolution output would look better on a television because it naturally blurs the pixels. Storage mediums play an important role in the development of a console game as it creates a fixed limit on the amount and quality of content that a game can have. Unlike arcade games but similar to PC and handheld games, console games are generally distributed separately from their platforms and require a form of storage to hold their data. There are 3 primary types of storage medium for consoles - cartridges, optical disc and hard disk drive, all of which have considerably improved over time and provide more storage space to developers with each improvement. Early cartridges had storage limitations which grew in size as the technology developed. They provided more security against third party developers and the illegal copying of games. Some could be partially re-writable allowing for games to save their data to the cartridge itself meaning no extra saving media was required. While cartridges became less popular with the introduction of disc based media, they are still popular to use for handheld consoles and are still in use on consoles in later generations such as the Nintendo Switch. Discs became popular as the storage medium for console games during the fifth generation due to the ability to store large amounts of data and be produced cheaply. The increase in space provided developers with a medium to store higher quality assets but means they had to take into account that you could not write to the disc. Most consoles that used discs had a means of saving game either on the console or in the form of a memory card which meant developers had to control the size of their game saves. It is common for games after generation six to be stored partially or fully on the console itself, most commonly on a hard drive. Similarly to how a PC game can be installed, the console game can copy key files to the console's storage medium, which is used to decrease load times but still requires the original game storage medium to play. The second method is for the game to be fully stored on the console and run directly from it, requiring no physical media to run at all. This offers players the opportunity to have games which have no physicality and can be downloaded through the Internet to their console, as well as giving the developers the ability to provide updates and fixes in the same manner, effectively meaning development on a game doesn't have to stop once released. As there is only a fixed amount of space on a console by default, developers do still have to be mindful of the amount of space they can take up, especially if the install is compulsory. Some consoles provide users the ability to expand their storage with larger storage mediums, provide access to removable storage and release versions of their console with more storage. Cloud gaming services allow players to access games as a streaming service. No specialist hardware is usually required to access these services and can be run from most modern PC operating systems negating the need for a dedicated device for console gaming. The question of ownership is the biggest difference in comparison to other storage mediums for console games as they could be considered only a method of renting the game. To play console games on any other device than the console it has been developed for, emulation of that console is required whether it is software or hardware based emulation and some console developers will provide this as a means to play games from their older systems on newer devices. For example, the Xbox 360 provides some access to Xbox games and the Wii's Virtual Console has a customised emulator with each game tweaked to provide the best performance as opposed to a single emulator to do everything. Where a PC is multi-functional and will be purchased to perform tasks other than gaming, a dedicated gaming console must have games available for it to be successful. A good library of games will give a consumer reason to purchase the console and in turn create opportunities for more games to be created for it. Console developers will lower their profit margins on devices to encourage sales of the games as more profit can be obtained from software royalties than the sale of the consoles themselves. Games are frequently used to market a console and can do so either by exclusivity to a specific console or by using existing popular intellectual properties (IPs) that already have a strong following. Pac-Man for the Atari 2600 was already a well known arcade game and was expected to help the sales of 2600 devices due to its popularity despite it being heavily criticized. A strong mascot can come organically from a game and can play a large part of a console's marketing strategy. A well designed and popular mascot will naturally generate further games. A good example of a mascot who has come from an existing game is Nintendo's Mario. He was created as a character for the Donkey Kong arcade game and wasn't expected to become popular yet has gone onto become one of the most iconic gaming characters in history. A character from a game can be designed to serve as a mascot, such as Sonic the Hedgehog. He was created with the intent to rival Mario and was designed with abilities to counter Mario's weaknesses. Both mascots exist outside of their respective video games and have become a part of the identity of each company, appearing in various types of media such as TV shows, books and movies as well as a large number of other video games. Following the emergence of mascots during the late 1980s and early 1990s, for a few years it was considered essential to a console's sales that it have a game starring a popular mascot. However, video game mascots became increasingly unimportant to console sales during the mid-1990s due to the aging games market (older gamers are less likely to find mascots appealing) and the stronger selling power of cross-licensing. A number of once-successful mascots such as Bonk, Gex, Bubsy, and Zool were dropped from usage in both marketing and software releases during this time. The few surviving mascots remain relevant due to their value in increasing brand awareness. The core development process for a console game is very similar to its counterparts and primarily differs in the high level concept due to demographics and the technical back-end. Consoles developers will usually make a development kit available to game developers which they can use to test their games on with more ease than a consumer model. Early console games were commonly created by a single person and could be changed in a short amount of time due to the simplicity of the games at the time. As technology has improved, the development time, complexity and cost of console games has increased where the size of a team for an eighth generation game can number in the hundreds. Similarly, the programming languages used in video game development has changed over time with early games being developed primarily in assembly. As time went on developers had more choice on what they could use based on the availability on the console but some languages became more popular than others. Many console developers will also have a branch of the company that develops games for their console and are considered "first party" developers, a concept that' isn't commonly seen in PC development due to the variation of hardware configurations and lack of complete ownership of a system by a single manufacturer. First party developers have the advantage of having direct access to the console's development which gives them the opportunity to make the most of the hardware they are developing for. Companies that are separate from the console manufacturer are considered to be "third-party" developers. They commonly have restrictions placed upon them and their games by the console manufacturers as a way to control the library of their consoles. The primary differences in arcade game development is the fact that players have to pay per play and arcade games are mostly found at external venues. Arcade games are ultimately developed to try to get a continuous stream of revenue from the player and to keep them playing over the life of the machine. Console games have a high cost up front so they had to develop with the consideration that the player would need to get something different out of the experience, primarily more content. Handheld gaming needs to be portable and able to play in shorter time frames which ultimately affects the type of games that are developed. Games that rely on long, unbroken sessions of gameplay or long cutscences are not ideal for handhelds where as a console player is expected to have longer sessions. On handheld consoles of a smaller size, developers need to consider the amount of detail that will be visible to the player whereas console developers can safely assume their games will be played on a larger screen such as a television. In comparison to PC and mobile games, console game developers must consider the limitations of the hardware their game is being developed as it is unlikely to have any major changes. PC and mobile technology progresses quickly and there are many different configurations of their hardware and software. This is beneficial at the start of a console's life cycle as the technology will be relatively current but as the console ages, developers are forced to work with ageing hardware until the next generation of consoles comes out. Earlier consoles games could be developed to take advantage of the fixed limitations they were be on (E.g., the Megadrive's capability of fast scrolling influenced design decisions in Sonic the Hedgehog)  Due to these hardware limitations the requirement of development kits and licenses required for development on a console is commonplace. Developing a console game will also mean having to pay royalties to the console developers as there is no centralised hardware developer for a PC. Early consoles didn't have development kit versions and it was only around the fifth generation of consoles that development kits became common. Unlike PC games, console game development usually requires the use of a development kit for the console that the game is being developed for as the hardware is often proprietary and is not freely available. The use of a development kit allows developers to access more detail about how their game is running on the kit and other advanced debugging options. The downside of needing access to a development kit is that it limited hobbyists being able to create home made or custom content easily without requiring specialist hardware. This grew into a benefit for PC games as they have a more open environment for hobbyists to create and modify content even if the developer doesn't support it. Some console developers have provided tools such as the Net Yaroze software development kit in an attempt to provide an avenue for hobbyists to create content. Console games primarily started off as ports of arcade games. The timing of early consoles coincided with the golden age of arcade games which gave developers a good opportunity to maximise on their popularity despite console hardware not being strong enough to run the games as they were originally. Arcade game effectively had to be remade for consoles which usually meant lowering the quality in some way to make up for the hardware limitations. As technology improved and arcades reduced in popularity it was console original games that would start to be ported to other devices such as handheld consoles and PC. Some consoles lack the ability to play games from previous generations which allow a developer to release older games again but on the new consoles. The re-released game may be unchanged and simply be the same game but run on the new technology or it can be changed by the developer to have improved graphics, sound or gameplay. Some re-releases can have added features such as Final Fantasy VII which added functions to speed the game up and turn off random enemy encounters. When high definition technology was released many games received a high definition remake, These can vary in what is updated but usually higher resolution textures, re-rendered videos, higher quality audio and compatibility with newer display technologies. High definition remakes offer an addition revenue stream for a console game that was potentially at the end of its life.. The developer of the remake is not always the same as the developer of the original game and some, such as Double Eleven, will specialise in ports and remakes of other games. The development of additional content prior to the internet was limited due to distribution method and the content had to released as a new game as opposed to an add-on to an existing one. For example, Grand Theft Auto: Vice City used the same mechanics and engine but was released as a separate game from Grand Theft Auto III whereas a PC title such as Total Annihilation offered downloadable content from 1997 While some Dreamcast games offered downloadable content, they were severely limited by the storage space of the console and the first console games to offer downloadable content properly were for the Xbox (console). It wasn't until generation 7 that console games began to support mods or custom content to the same extent as PC games. DLC can range from small content additions like extra items to larger ones that may include significant plot additions and extend the game considerably. Several systems exist worldwide to regulate or censor the video games industry. Some, like the Entertainment Software Rating Board (ESRB) are composed of members of the industry themselves, while others, like Pan European Game Information (PEGI), are government-backed. The ESRB was started in 1994, was adopted as standard 10 years later and is rated on the interactive experience as well as the content. From time to time, video games have been criticized by parents' groups, psychologists, politicians, and some religious organizations for allegedly glorifying violence, cruelty and crime, and exposing children to these elements. It is particularly disturbing to some that some video games allow children to act out crimes (for example, the Grand Theft Auto series), and reward them for doing so. Concerns that children who play violent video games may have a tendency to act more aggressively on the playground have led to voluntary rating systems adopted by the industry, such as the ESRB rating system in the United States and the PEGI rating system in Europe. They are aimed at educating parents about the types of games their children are playing to let them make an informed decision on whether allow them to play. Studies have shown that most parents who complain about their young children acting increasingly aggressive and violent on the school playground due to video games do not follow the ESRB and PEGI rating systems. Many parents complain about their children, as young as 8, acting out violence depicted in Call of Duty or Grand Theft Auto, even though their ratings clearly state that the recommended age is 18 and above. Most studies, however, reached the conclusion that violence in video games is not causally linked with aggressive tendencies. This was the conclusion of a 1999 study by the United States government, prompting Surgeon General David Satcher to say, "[...] we clearly associate media violence to aggressive behavior, but the impact was very small compared to other things. Some may not be happy with that, but that’s where the magic is". This was also the conclusion of a meta-analysis by psychologist Jonathan Freedman, who reviewed over 200 published studies and found that the majority did not find a causal link. Video game consoles were banned in China between June 2000 and July 2015. ^ Barton, Seth (June 4, 2018). "Xbox head of first-party development: 'We need to use established franchises as a home base from which we can expand'". MCV. ISSN 1469-4832. Retrieved January 15, 2019. ^ Cleaver, Sean (June 6, 2017). "New Xbox video shows off Project Scorpio XDK". MCV. Retrieved January 15, 2019. ^ Parfitt, Ben (October 16, 2015). "Nintendo begins sending NX development kit to devs". MCV. ISSN 1469-4832. Retrieved January 15, 2019. ^ Kidwell, Emma. "Discovering the first video game commercial". www.gamasutra.com. Retrieved January 14, 2019. ^ Cohen, D. S. (November 5, 2018). "Magnavox Odyssey - The First Gaming Console". Lifewire. Retrieved January 15, 2019. ^ Knowles, Kitty (March 25, 2015). "A history of videogames: the defining moments from Nimrod to now". British GQ. Archived from the original on September 28, 2015. Retrieved January 14, 2016. ^ Barton, Matt and Loguidice, Bill. (May 8, 2008). A History of Gaming Platforms: Mattel Intellivision, Gamasutra. ^ Barton, Matt and Loguidice, Bill. (2007). A History of Gaming Platforms: The Vectrex, Gamasutra. ^ Lu, William. "Evolution of Video Game Controllers" (PDF). Retrieved March 28, 2013. ^ Nick Montfort; Ian Bogost (January 9, 2009). Racing the Beam: The Atari Video Computer System. MIT Press. p. 5. ISBN 978-0-262-26152-4. one of the VCS launch titles, Video Olympics, offered a one-player “Robot Pong” mode that provided an opponent who, although not anthropomorphic, managed to be challenging without being impossible to defeat. ^ Nick Montfort; Ian Bogost (January 9, 2009). Racing the Beam: The Atari Video Computer System. MIT Press. p. 6. ISBN 978-0-262-26152-4. Others remain infl uential, such as the graphical adventure game, the prototype of which was Atari’s Adventure, and the platformer, pioneered in Activision’s Pitfall! ^ a b Richard Rouse; Steve Ogden (2005). Game Design: Theory & Practice. Wordware Pub. p. 108. ISBN 978-1-55622-912-1. In many console action games, different buttons on the controller will perform the same action. ^ David Sheff; Andy Eddy (1999). Game Over: How Nintendo Conquered the World. GamePress. p. 150. ISBN 978-0-9669617-0-6. By 1983, the $3 billion video-game industry had turned into a trickle—$100 million in sales for the entire industry—yet Atari and dozens of other companies were still churning out games by the millions. ^ Kleinfield, N.R. (October 17, 1983). "Video Games Industry Comes Down To Earth". The New York Times. Retrieved September 21, 2018. ^ Adrian (May 9, 2016). "INTERVIEW – DAVID CRANE (ATARI/ACTIVISION/SKYWORKS)". Arcade Attack. Retrieved May 10, 2016. ^ Buchanan, Levi (August 26, 2008). "Top 10 Best-Selling Atari 2600 Games". IGN. Retrieved March 25, 2017. ^ Karl Gratzer; Dieter Stiefel (2008). History of Insolvency and Bankruptcy from an International Perspective. Södertörns högskola. p. 170. ISBN 978-91-89315-94-5. ...the effects of the video game crash of 1983 being more severe in the U.S. than in Europe and Japan. ^ Heather Maxwell Chandler (2009). The Game Production Handbook. Jones & Bartlett Publishers. p. 371. ISBN 978-1-934015-40-7. ^ "Why Are Current Consoles Not Backward Compatible?". GameSpot. Retrieved April 3, 2017. ^ "The Metroid Retrospective – Part 1". GameTrailers. June 6, 2006. Retrieved April 8, 2014. ^ Drake, Audrey (July 20, 2011). "What Metroid Did for Women in Gaming". IGN. Retrieved April 3, 2017. ^ Andrew Rollings; Ernest Adams (2003). Andrew Rollings and Ernest Adams on Game Design. New Riders. p. 405. ISBN 978-1-59273-001-8. ^ Houser, Dan (November 9, 2012). "Americana at Its Most Felonious: Q. and A.: Rockstar's Dan Houser on Grand Theft Auto V". The New York Times (Interview). Interviewed by Chris Suellentrop. Archived from the original on November 10, 2012. Retrieved July 30, 2015. ^ Justin Speer and Cliff O'Neill. "The History of Resident Evil". GameSpot. Archived from the original on September 6, 2008. Retrieved March 28, 2017. ^ Guinness World Records: Gamer's Edition 2009, page 103. ^ "Internet Access, Network Games Hit Saturn - For Less than $400". Electronic Gaming Monthly. No. 84. Ziff Davis. July 1996. p. 18. ^ Tracy Fullerton (February 8, 2008). Game Design Workshop: A Playcentric Approach to Creating Innovative Games. CRC Press. p. 131. ISBN 978-0-240-80974-8. Console games usually provide a proprietary controller. ^ Morgan McGuire; Odest Chadwicke Jenkins (2009). Creating Games: Mechanics, Content, and Technology. Taylor & Francis. p. 397. ISBN 978-1-56881-305-9. Game pads (such as an Xbox 360 or Guitar Hero controller) often use a combination of digital keys and analog joysticks. ^ Lu, William. "Evolution of Video Game Controllers" (PDF). Retrieved March 28, 2013. ...the controller also specifies the type of experience the player will have by defining what types of games are best played on it due to its design. ^ Morgan McGuire; Odest Chadwicke Jenkins (2009). Creating Games: Mechanics, Content, and Technology. Taylor & Francis. p. 104. ISBN 978-1-56881-305-9. Video games depend on their control schemes. ^ Morgan McGuire; Odest Chadwicke Jenkins (2009). Creating Games: Mechanics, Content, and Technology. Taylor & Francis. p. 395. ISBN 978-1-56881-305-9. A user interface is the player’s entry point into the game world. It governs how a player experiences the virtual environment, game dynamics, and underlying story put forth in a game. ^ Brunner, Grant. "How storage media decides the fate of console games". www.extremetech.com. Retrieved January 15, 2019. ^ Tracy Fullerton (February 8, 2008). Game Design Workshop: A Playcentric Approach to Creating Innovative Games. CRC Press. p. 423. ISBN 978-0-240-80974-8. ^ Cunningham, Andrew (April 24, 2018). "How to make your old Game Boy as good as (or better than) new". Ars Technica. Retrieved January 14, 2019. ^ "Nintendo Switch Specifications". Nintendo of Europe GmbH. Retrieved January 14, 2019. ^ a b Malik, Om. "The Game: PlayStation vs N64". Forbes. Forbes. Retrieved March 28, 2017. ^ Totilo, Stephen. "How Mandatory Game Installations Will Work On PS4". Kotaku. Retrieved January 15, 2019. ^ "Installing Games on Xbox One". support.xbox.com. Retrieved January 15, 2019. ^ a b "Digital Games FAQ | Xbox One Digital Games". support.xbox.com. Retrieved January 15, 2019. ^ Dornbush, Jonathon (May 9, 2017). "Prey: Bethesda Aiming to Have a Patch to Fix Game-Breaking Bugs 'This Week'". IGN. Retrieved June 3, 2017. ^ "Install Xbox 360 Hard Drive | Remove Xbox 360 Hard Drive - Xbox.com". support.xbox.com. Retrieved June 3, 2017. ^ "Get your PS4 external hard drive support and PS4 Boost Mode in update 4.50, available now". gamesradar. Retrieved June 3, 2017. ^ "Playstation 3 Console Model List". www.ausgamestore.com. Retrieved June 3, 2017. ^ "What Is the Difference Between Xbox 360 Models?". LevelSkip. Retrieved June 3, 2017. ^ Leadbetter, Richard (December 9, 2017). "Xbox One backwards compatibility: how does it actually work?". Eurogamer. Retrieved January 14, 2019. ^ Hubner, John; William F. Kistner Jr. (November 28, 1983). "What went wrong at Atari". InfoWorld. Vol. 5 no. 48. InfoWorld Media Group, Inc. p. 157. ISSN 0199-6649. ^ "Fall 1982 Complete Home Video Games Buyer's Guide Video Games Player - Vol 1 No 1 (1982-09)(Carnegie Publications)(US). p.59". archive.org. Retrieved May 9, 2017. ^ "Playback 93". Yahoo. December 2, 2009. Archived from the original on December 11, 2009. Retrieved December 24, 2009. ^ "Nintendo's Shining Star: The History of Mario". Gamecubicle. Retrieved August 23, 2008. ^ "Crash Bandicoot". Next Generation. No. 19. Imagine Media. July 1996. pp. 48–49. ^ Andrew Rollings; Ernest Adams (2003). Andrew Rollings and Ernest Adams on Game Design. New Riders. p. 174. ISBN 978-1-59273-001-8. ^ a b Linda L Crawford; Chris Crawford (January 1, 1984). The Art of Computer Game Design: Reflections of a Master Game Designer. McGraw-Hill Osborne Media. p. 46. ISBN 978-0-07-881117-3. Finally, my experience in game design is primarily with personal computers, so my suggestions are not completely applicable to arcade game designers or home video game designers. ^ Andrew Rollings; Ernest Adams (2003). Andrew Rollings and Ernest Adams on Game Design. New Riders. p. 13. ISBN 978-1-59273-001-8. ^ "Credits - Battlelog / Battlefield 4". battlelog.battlefield.com. Retrieved April 15, 2017. ^ Andrew Rollings; Ernest Adams (2003). Andrew Rollings and Ernest Adams on Game Design. New Riders. p. 46. ISBN 978-1-59273-001-8. ^ Andrew Rollings; Ernest Adams (2003). Andrew Rollings and Ernest Adams on Game Design. New Riders. p. 44. ISBN 978-1-59273-001-8. ^ Jesse Schell (August 4, 2008). The Art of Game Design: A book of lenses. CRC Press. p. 407. ISBN 978-0-12-369496-6. ^ Tracy Fullerton (February 8, 2008). Game Design Workshop: A Playcentric Approach to Creating Innovative Games. CRC Press. p. 429. ISBN 978-0-240-80974-8. However, when publishers distribute a game on a console system, they must enter into a strict licensing agreement with the console maker, in which they agree to pay a licensing royalty for every unit sold. ^ "Tidbits". Electronic Gaming Monthly. No. 88. Ziff Davis. November 1996. p. 22. ^ Andrew Rollings; Ernest Adams (2003). Andrew Rollings and Ernest Adams on Game Design. New Riders. p. 83. ISBN 978-1-59273-001-8. ^ Kent, Steven L. (2001). The Ultimate History of Video Games: From Pong to Pokémon. Three Rivers Press. ISBN 0-7615-3643-4. ^ "Backwards Compatibility: Which Consoles Offer It?". Low End Mac. November 21, 2015. Retrieved April 16, 2017. ^ Schreier, Jason. "Two 'Cheats' Make Final Fantasy VII Way Better On PS4". Retrieved April 16, 2017. ^ "About Us". Double Eleven. Retrieved April 16, 2017. ^ Giskard (October 12, 2012). "Total Annihilation: An RTSG Classic". The Engineering Guild. Archived from the original on June 20, 2013. Retrieved June 18, 2013. Total Annihilation was one of the early adopters of the DLC releases and every month Cavedog would release a new unit for free to try with the game. ^ Goldstein, Hilary (July 16, 2004). "Ninja Gaiden Hurricane Pack Vol. 1 Q&A - New details on the enemies, AI changes, and camera fixes. Exclusive screens show off even more enemies and a second costume!". Retrieved December 17, 2013. ^ Hood, Vic. "Buy the other half of your furniture with the latest Sims 4 Stuff pack". PCGamesN. ^ Thorsen, Tor (July 24, 2009). "Force Unleashed unleashing more DLC, Sith Edition". GameSpot. Archived from the original on July 28, 2009. Retrieved July 25, 2009. ^ "Games content 'concerns parents'". December 4, 2007. Retrieved January 14, 2019. ^ "In the news - Ban violent video games, urge MPs". Tes. May 25, 2016. Retrieved January 14, 2019. ^ Stewart, Diane (April 16, 2013). "Children and Violent Video Games". United Church of God. Retrieved January 14, 2019. ^ Jessica Shepherd (April 3, 2012). "Children becoming addicted to video game fantasy worlds, teachers warn". The Guardian. Retrieved October 28, 2012. ^ Paton, Graeme (April 3, 2012). "Violent video games are fuelling rise in aggressive behaviour". The Telegraph. Retrieved October 28, 2012. ^ Wright, Brad (February 18, 2004). "Sounding the alarm on video game ratings". CNN. Retrieved November 23, 2011. ^ Freedman, Jonathan (September 1984). "Effect of television violence on aggressiveness". Psychological Bulletin. 96 (2): 227–246. doi:10.1037/0033-2909.96.2.227. ^ Yan, Sophia (July 27, 2015). "China eliminates all restrictions on gaming consoles". CNNMoney. Retrieved August 25, 2016. ^ Burkitt, Laurie (July 25, 2015). "China to End Ban on Videogame Consoles". Wall Street Journal. ISSN 0099-9660. Retrieved August 25, 2016. ^ Leslie Hook (June 18, 2012). "Lenovo's Kinect-clone evades Chinese ban on video-game consoles". The Globe and Mail. Retrieved August 20, 2012. ^ Luke Ume (December 15, 2011). "Console Revolution". The Escapist. Retrieved August 20, 2012.